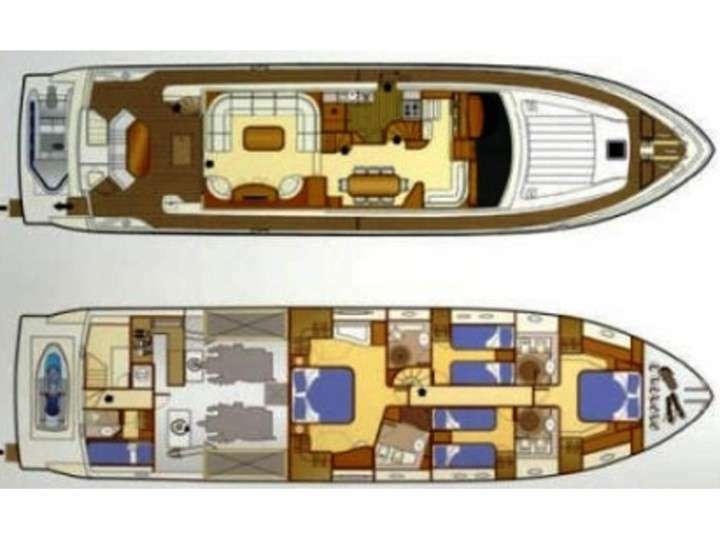 M/y Marino has 4 cabins, all fully air-conditioned: 2 double cabins and 2 twin cabins. All cabins have ensuite facilities. Communicate: Wi-Fi coverage is good throughout the Adriatic however it cannot be guaranteed in all cruising areas. M/y Marino has a young, professional, dynamic and passionate crew. The Captain, Mateo Bencun was born in 1984. and has professional qualification for Yacht Master up to 500 GT. He started his maritime career in 2009. as a deckhand on few different yachts ranging from 20 to 50 meters. Since 2015. he is working as a Captain and has cruising experience on the Adriatic, Ionian and Mediterranean sea. He was a Captain on busy charter yachts and is confident to provide perfect yachting experiences to his guests together with his crew. Mateo is fluent in English, Italian and has basic knowledge of German. The Chef, Marino Brkovic, born in 1986., has 10-year experience working as a Chef in exclusive Croatian restaurant Martinis Marchi where he had the chance to cook for some of the world's most famous celebrities and royal families. Marino has worked beside and learnt from the most famous worlds' chefs and has upgraded this gained knowledge with his own creations. He is also well educated to balance and adjust meals for special nutritional needs and is very communicative with guests after many live cooking manifestations and food presentations he held throughout his career. Besides restaurants on the shore, he has worked on yachts for 3,5 years and has fell in love with this type of service. Marino is fluent in English and has some basic knowledge of German. Tamara Petrovic, born in 1987., is a solo stewardess on M/y Marino since 2018. She commenced her career in the yachting industry in 2007. Tamara has many summer seasons behind her working as a deckhand, beautician, solo and chief stewardess on both, private and busy charter yachts. She cruised throughout the whole Mediterranean, in Greece and on the Adriatic Sea. Besides being competent in maintaining the order and cleanliness of the yacht's interior, Tamara is knowledgeable of silver service serving and is great with children. She is fluent in English and has some basic knowledge of Italian and Spanish. Captain Mateo and his crew are looking forward to welcoming their guests on board. Other Toys: Rendezvous diving only.